You may know we have an average of 325 days of sunshine per year and miles of sparkling waters to play in and sugar-white beaches to explore. 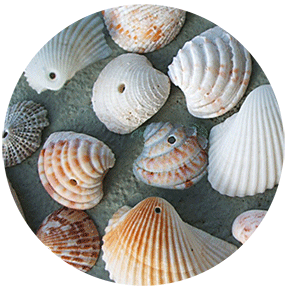 You probably know the crystal waters of the Gulf of Mexico and miles of pristine beaches are treasured by locals and sought out by visitors from all over the world for their beauty and solitude. But here are some things about Santa Rosa Island you might not know. 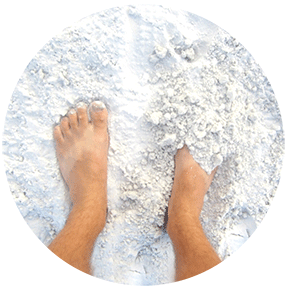 Quartz in the sand from the Appalachian Mountains is what makes it so brilliantly white, and visitors soon discover the “barking” the sand produces as they walk in the softer areas. 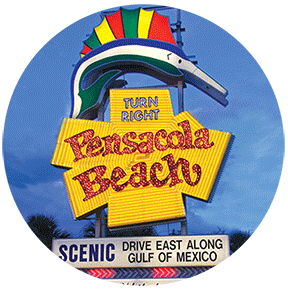 The 40-foot flashing neon fish sign was created in 1955 for Downtown Pensacola. In 1962, it was moved to its current location in Gulf Breeze, standing as a welcome sign for out-of-town visitors, leading the way to paradise. 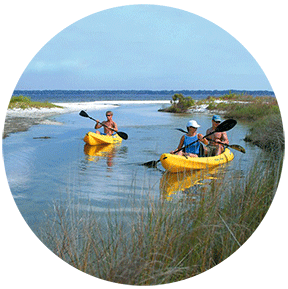 A serpentine sand trail near Fort Pickens leads to a deep brackish lake that lies only yards from the Gulf. The lake, created by fresh water welling up from the deep sandstone aquifer, gives visitors a rare chance to take a dip in the salty Gulf while seconds later plunging into almost-fresh water. 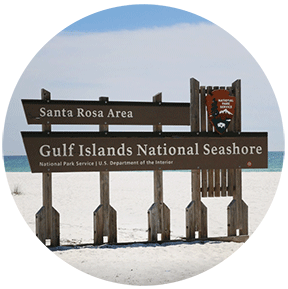 The federal government sold Santa Rosa Island to Escambia County in 1929 for $10,000. What a deal! Just a few years later, the casino, a combination dance hall and gathering place that locals ferried back and forth to from town, was built. 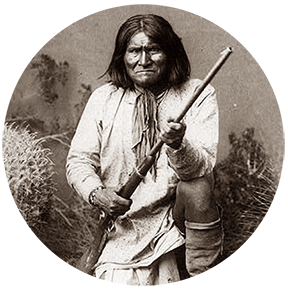 Famed Apache chief Geronimo was held captive in 1886 and 1887 at Fort Pickens, a massive pre-Civil War brick fortress located at Gulf Islands National Seashore. It is believed that he was Pensacola’s first tourist attraction, as once he was visited by 459 curious onlookers in a single day. 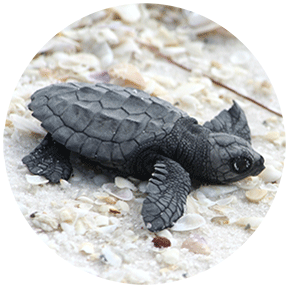 There are five species of sea turtles found in the Gulf of Mexico, and three of these are known to nest on Pensacola Beach: the loggerhead, the green, and the Kemp’s ridley. The vast majority of these nesting turtles are loggerheads. Females return every Spring and crawl onto the beach under the cover of darkness, moving above the high tide line and many times all the way to the dune field so that the nest is not overwashed by the waves. The mother turtle digs a nest cavity about three feet deep and deposits about 100 eggs, returning to the water and leaving them to their fate hatching and making it to the sea. Unspoiled beaches stretch for more than 18 miles, with the core business district bordered on either side by protected, natural areas designated as the Gulf Islands National Seashore. 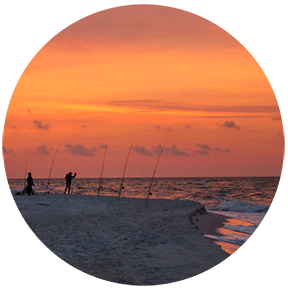 This area extends west to Fort Pickens and east to Navarre Beach, a neighboring beach community.